Deborah Pierce Bonnell is an artist living in Connecticut. 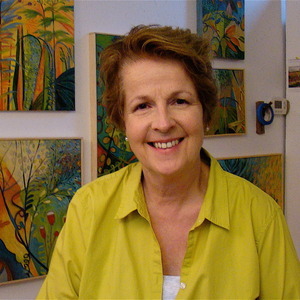 She primarily paints the landscape, in a realistic or somewhat abstracted form. The colors and patterns of trees, leaves, plants, moss and ferns are what she finds most interesting. Deborah works in oil on canvas, encaustic on panel, pastel, watercolor and monotype. She has exhibited in one-person and group shows in Connecticut, Texas and New York, and her work appears in numerous private collections. A graduate of the Rhode Island School of Design, she has spent several residencies at the Vermont Studio Center, and works part-time as an art educator.